No one knows what Firefly's real name is or what he looks like. He is known by his work. Expert in NATO and Warsaw Pact explosives and detonators. Always places his charges in the one place that affords maximum damage. There is no question about his infiltration skills since no one has ever reported seeing him enter or leave any target area. Any frogman can operate efficiently in clean water, under optimum conditions, but the Undertow are especially trained to function and fight in the murky, polluted waters that clog busy industrial and military waterfronts. Their wetsuits is made of a nontoxic, anti-corrosive material. Their facemasks are coated with silicone to repel oil slicks, and are organically conditioned against hostile biological agents and infections. Undertow will swim through ANYTHING! These guys makes leeches look friendly! It's almost impossible to defeat him in his own environment! If we have to take him on his own backyard, we first have to get tetanus booster shots before we move out for action. The best defense against this slime-swimmer is to keep a safe distance and throw grenades from behind a well fortified enclosure. Contribute pictures, update details or suggest corrections for Firefly / Undertow. 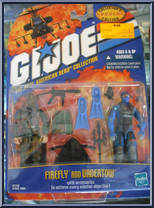 Write a review about Firefly / Undertow.